This is the most important book I have read. You should buy it before it becomes the victim of the diktats of the Iiberal elite and is removed from sale by force of law. This country has over the last twenty years undergone a fundamental change to our values and beliefs. And not for the better. Politicians of all colours willingly submitted to the EU pressure to allow free movement of people's across borders whether they shared our values or otherwise. Further there has been to this the political Left's commitment to multiculturism and diversity which have been adopted by the centrist Tory party. All governments have also allowed Saudi money to fund fundamentalist organisations in the UK in exchange for money and arms contracts More specifically as if to deliberately undermine our way of life and Christian values, many hundreds of thousands of Muslims have been given leave to stay. This book explains why we should be fearful of such a reckless course. Anyone who reads the Koran with an open mind will know that violence is within the DNA of Islam. Violence is its raison d' etre. It was written by a warlord as a manual for his followers. For those stating that most Muslims are peaceful it should be noted that their prophet called the peaceful Muslims "hypocrites" for their lack of violence. In any society it only takes an influential small percentage to lead the vast majority. With Allah on your side who can fail. 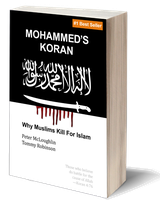 Tommy sets out in his very informative introduction, the sad violent history of Islam and the pathetic manner in which our politicians have bowed their heads to Islam because of the potential threat of violence.